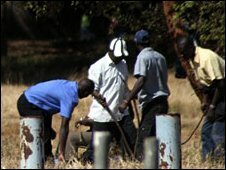 Zimbabwe could be heading for a new wave of violence, a minister in the country's unity government has warned. Sekai Holland, a member of the former opposition MDC, told the BBC opponents of the power-sharing government were drawing up assassination lists. She said she believed the worst violence was being planned to coincide with elections due in 18 months. Her comments echo earlier claims by PM Morgan Tsvangirai of ongoing political intimidation and abuses in Zimbabwe. Ms Holland, Zimbabwe's Minister for National Healing, Reconciliation and Integration, told the BBC that she and other members of the Movement for Democratic Change (MDC), including fellow ministers, were receiving threatening phone calls every day. They had been told that hardline members of President Robert Mugabe's Zanu-PF party are adding their names to a lengthening assassination list. "We are told that they do have a list of people that they will kill," she said. "No-one feels safe in Zimbabwe, no-one - and I mean no-one. We haven't reached a ceasefire. We are still at a point where people have their guns cocked." Ms Holland is a senior member of the MDC and was badly beaten by Zanu-PF supporters two years ago. 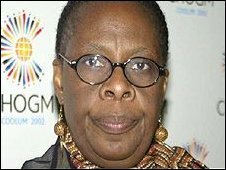 Ms Holland also claimed that 39,000 militiamen "working inside the civil service and outside" were being paid a wage of $100 (£62) a month to beat up MDC supporters, in the event of an election. This, she said, meant that violence in the next elections could be even worse than in 2008, when some 200 people were killed and thousands injured. Last month Mr Tsvangirai, the prime minister and leader of the MDC, criticised the speed of political change in Zimbabwe. He said that although the MDC was in government, it had not succeeded in restoring the rule of law and warned his party that Zimbabweans remained hungry and afraid of political persecution. But Mr Tsvangirai, currently on a tour of Europe seeking financial aid, has insisted that the government would stabilise the situation in Zimbabwe. He said it was "a work in progress", but that the "period of acrimony" between him and Mr Mugabe was "over".